Plain nails are not my thing! But doing a nail art every time is not possible. 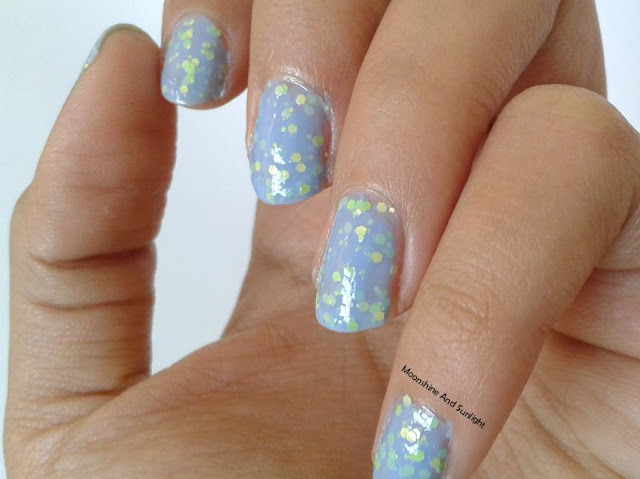 Nail polishes with chunky glitters in them make the perfect shortcut for getting snazzy nails, without lot of effort! But, the problem with these is the availability. Thankfully, now, these are available easily and also at a reasonable price. With Maybelline’s launch of the ColorShow Go Graffiti nail colors, we have three options of nail polishes with chunky glitters. But, I am afraid, all the three are pastel shades. 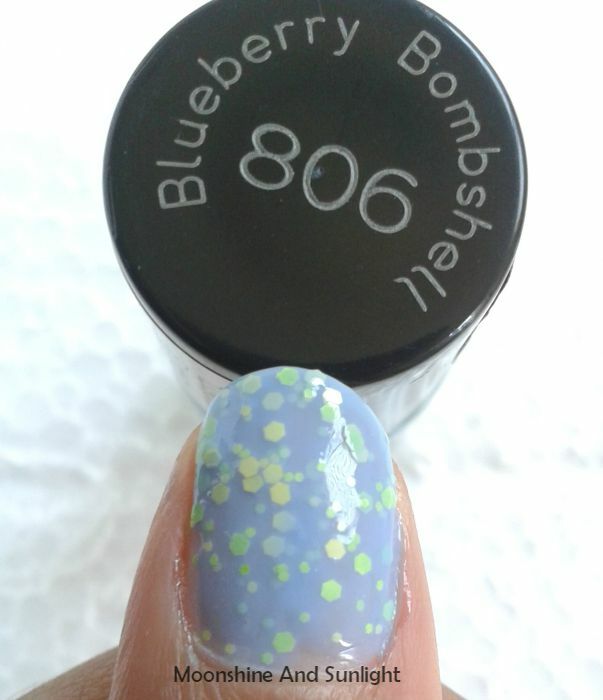 The one I have with me, Blueberry Bombshell (806), is a pastel blue with a tinge of purple. 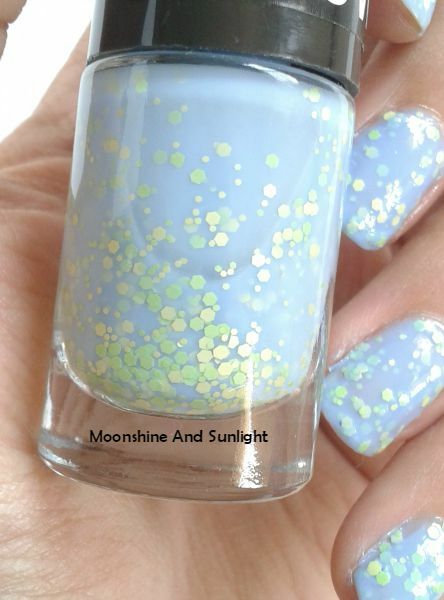 This has a jelly base, purple-ish blue shade with loads of chunky hex glitters in light yellow and green. The glitters are of two sizes chunky and micro. Honestly, I don’t like the shade much, I had received this along with the Rebel Bouquet lipsticks, from Maybelline. I need three coats for this to go opaque, which is expected of a jelly polish. If I had needed one more coat, I would have not used it again. I get start getting icky with the third layer itself. It has a glossy finish in general, but you have to use a top coat to smooth it out properly.I haven't used any top coat here. 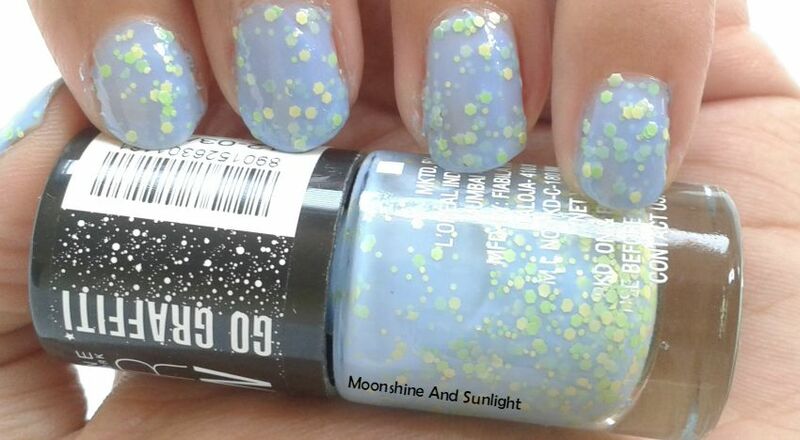 It has a generous amount of the glitters which makes the finish uneven. It starts chipping lightly after a day or two but stays in place otherwise. This would be great for nail art because of the chunky matte glitters. But, not as a base because it might be slightly uneven. The brush is standard color show brush. Serves the purpose. 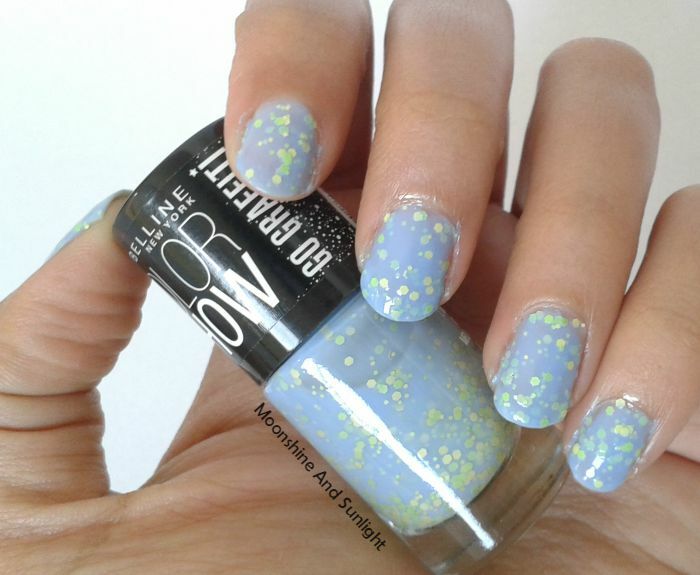 I am not a huge fan of this one, but I do wish Maybelline comes out with the “Acid Wash” nail polishes soon! I would recommend trying it out first at any counter before buying , because when I bought “Red splatter" from this range , I had seen a bottle of this color at the store which was all milky and weird. So, the color might not show up properly. Have you tried this earlier ?? Did you use this as a top coat?? ?